The dentist applies a gentle etching solution to the patient’s teeth and leaves it in place for about 15 seconds. A rubber dam is used to prevent the solution from entering the patient’s mouth. The dentist applies the bonding material itself, gently shaping it so that it fills in chips, uneven spots, and other imperfections. Once this step is complete, the dentist uses a special light-activated device to harden the bond to the teeth. The result is a beautifully enhanced smile that can improve every aspect of the patient’s life. Cosmetic bonding normally last about 10 years with proper care. Your dentist will first perform a complete oral exam to make sure you’re not suffering from tooth decay or other oral health concerns. Restorative work such as root canals is sometimes needed before cosmetic bonding is feasible. Tooth decay is a progressive illness that typically starts at the top of the tooth and works its way to the roots. In many cases, this means that the base of the tooth can be saved even if the top portion cannot. In such cases, your dentist may recommend a crown to prevent further damage. The process of receiving a dental crown begins with your dentist gently shaping the tooth to receive the restoration. You will receive anesthetics and possibly mild sedatives for your comfort. The restoration itself is typically crafted from ceramic, gold, porcelain over metal, or resin. 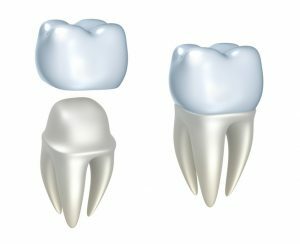 Modern crowns are coated with enamel to emulate the look of your natural teeth. The crown is held in place with a special dental adhesive similar to the material used in cosmetic bonding. A properly placed crown can last from 10 years to a lifetime. Crowns look and function exactly like healthy natural teeth. Enjoying the most benefit from either cosmetic bonding or a dental crown requires reasonable self-care on the patient’s part. This includes brushing 2-3 times a day, flossing at least once per day, minimizing consumption of sweets and simple starches, and seeing your dentist every six months or so for cleanings and checkups. It’s also important to avoid tobacco and illicit drugs and consume alcohol only in moderation. Your dentist may make other recommendations at the time of treatment. Modern cosmetic and restorative dentistry makes it possible for almost anyone to enjoy healthier teeth. Talk to your dentist about the treatment options mentioned in this post during your next appointment. You’ll look back on the decision with plenty of reason to smile. Dr. Angelo M. Julovich has been practicing dentistry for almost 40 years, including 11 years here in his Zionsville office. Dr. Julovich earned his DDS degree from the Indiana University School of Dentistry in 1982. You can reach his office online or by calling (317) 769-3335.